Home/Building Maintenance/A successful relationship between facilities maintenance companies and their customers can never be an Us versus Them situation. When contractors gather to discuss the industry, inevitably the conversation turns to what I’ll politely refer to as “challenging” clients. While there are many legitimate components that can contribute to a difficult relationship, such as, limited service hours, geographically hard to reach locations and demanding response times, challenging is contractor speak for cheap and not wanting to pay for services. While budgets are always amongst the top priorities for both facility managers and service providers, I believe that for the most part, there is a misunderstanding of the message the clients are sending to their service providers. Managing a company’s growth is the business owner’s responsibility. Not the client’s. There is a big difference between not wanting to appropriately compensate service partners and not wanting to overpay them. As facility service groups continue to become a more common resource for in-house facility managers, their rapid growth is creating more overhead and even greater pressure for increased revenues. Thereby creating an environment that pushes the company far from the model that made it successful in the first place and creating a relationship where your client questions your invoices. The more new clients I meet with, the more I hear about non self-performing aggregators having reduced themselves to nothing more than dispatchers of trades and a factory belt of estimates that they have no real knowledge about. Sure, clients used to get timely communications, detailed estimates and an understanding that their account manager was hand-on and had knowledge of the details of each project. Now, the stress of growth coupled with the over reliance on software to automate the process, has maintenance companies targeting volume and not quality. In this industry, that is a surefire formula for failure. 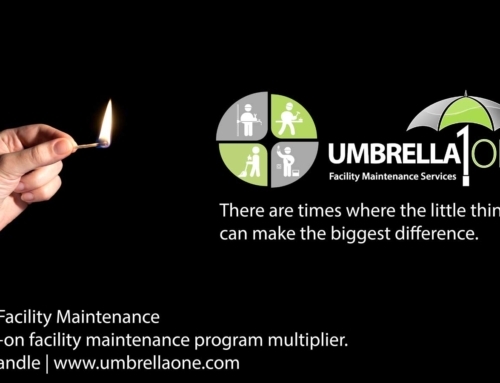 Make no mistake, UmbrellaOne’s goal is to grow and reach our full potential. However, we’ll do it by sticking to our original model of caring for the customer and providing a personal experience. Sure, we invest heavily in software to help streamline and organize our operations, but we’ll always be people first, software second. Our account managers will understand the task at hand and be able to speak intelligently about it when required. It is this approach that will result in our customers identifying the role we play, the value we bring and the dollar amount listed on their invoice.